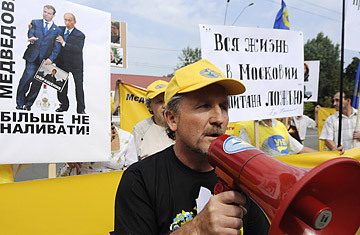 Ukrainians holds hold a poster depicting Russian President Dmitry Medvedev and Prime Minister Vladimir Putin and a comment reading "No more drinking for Medvedev" in front of the Russian embassy in Kiev, Ukraine. The poster, right, reads "All life in Moscow is impregnated with lies." The much-trumpeted "reset" of relations between Russia and the U.S. was dealt a slap in the face last week as Moscow went on the offensive against Ukraine and Georgia. After Russian President Dmitri Medvedev waded into Ukrainian politics with barbed criticism of his Ukrainian counterpart's "anti-Russian" policies, Prime Minister Vladimir Putin embarked on a provocative trip to reaffirm support for Abkhazia, the Moscow-backed territory that enjoys de facto independence from Georgia. While Washington insists that it will not recognize a Russian "sphere of influence," the moves by Medvedev and Putin place a question mark over the Obama Administration's ability to check Russia's determination to forcefully push what it calls its "privileged interests" in its neighboring countries. The flurry of diplomatic activity came symbolically on the anniversary of last summer's Russia-Georgia war, in which Moscow intervened on behalf of the breakaway Georgian regions of South Ossetia and Abkhazia. The reset, announced by U.S. Vice President Joe Biden in February, was meant to signal the rebuilding of the relationship between the U.S. and Russia that had soured under George W. Bush. But despite some progress on issues such as arms control and Afghanistan when U.S. President Barack Obama visited Moscow in July, it's back to business as usual for Russia with its neighbors, as it tries to assert its authority despite the U.S.'s disapproval. "The one thing that could most endanger the reset policy would be really bad Russian behavior in the post-Soviet states," says Steven Pifer, a former U.S. ambassador to Ukraine and now a visiting fellow at the Brookings Institution in Washington, D.C. "The Russians don't want to recreate the Soviet Union, but they do want a system in which their neighbors pay close deference to what Moscow determines to be its vital national interests. The United States has a different view." After weeks of escalating diplomatic tensions between Russia and Ukraine, including mutual expulsions of diplomats, Medvedev on Aug. 11 unleashed a tirade of complaints in a letter and video blog posted on the Kremlin web site, in which he accused Ukrainian President Viktor Yushchenko of bringing relations to "unprecedented lows." Since coming to power in 2005  after mass protests known as the Orange Revolution overturned a ballot rigged in favor of Moscow-backed candidate Viktor Yanukovych  Yushchenko has riled the Kremlin with his attempts to drag Ukraine away from Russia's sphere of influence and toward the West. But observers in Kiev say Medvedev's attack only proves that Russia has learnt nothing from its botched intervention in 2004, and that the latest move is likely to backfire  despite a generally positive attitude toward Russia, Ukrainians often react negatively when they feel they're being bullied. And although the leading contenders for the Ukrainian presidency are less overtly opposed to Russia's demands than the incumbent (who is running despite low approval ratings), Moscow is set to be disappointed if it thinks a change in leadership is going to bring Ukraine back into its fold. Even ostensibly pro-Russian Yanukovych has in the past blown hot and cold on NATO integration, a goal of Yushchenko's that has consistently irked Moscow. The breakaway Georgian territories of South Ossetia and Abkhazia are proving more pliable. With Nicaragua the only country other than Russia to recognize their independence, they are reliant on support from Moscow, which has been happy to oblige. The day after Medvedev's letter was made public, Prime Minister Putin visited Abkhazia, pledging around $500 million in military aid. Georgia reacted angrily, calling the visit "a provocation carried out quite in the tradition of Soviet special services," a reference to Putin's KGB past. The anniversary of the conflict in South Ossetia also saw Medvedev backing an initiative that would give a legal basis for deploying the Russian military abroad to defend Russian citizens and armed forces from attack  precisely the reason given by Moscow for its intervention last year. This raises concerns about the Kremlin's designs on Ukraine's Crimean peninsula, which has a large ethnic Russian population and is home to the Black Sea Fleet.